…he did a little Irish Jig over in his yard, and he was so funny. We made his day! Then there was the day we went to a local nursery and bought our hawthorn tree (named “Nathaniel” after my cousin Nathaniel Hawthorne, of course) and came home and planted it. You can also see those huge pine trees in one of the photos above. Here’s our Paul finishing up the planting of Nathaniel. Our yard is on ledge here and we could only dig down so far to put in that hawthorn tree. I wasn’t sure if it would thrive there, but it must have doubled in size since we planted him, and even though it’s not a very ornamental tree, it’s the Tree of England, as I call it. In England, everywhere you go there are hedgerows which are hawthorn trees cut back to form the hedges. These mark the boundaries of the different fields especially out in the countryside where we always go when in England. 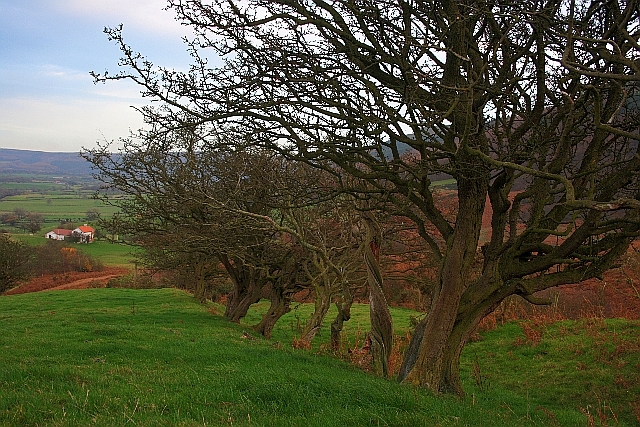 Photo above shows hawthorn trees in England. They use dry stone walls, as well, but before the stone walls, they would grow hawthorn bushes and keep pruning them back so they would get nice and thick. Above shows our house just after we bought it and moved in. It was unfinished clapboards and nothing much had been done in either the front or rear garden areas at all. The same view of the house taken about 5 years later shows a few changes. Not the neatest of back gardens, I admit. But we took down two giant trees in the back yard as you can see and changed the windows in the little breakfast room that leads to the side deck on the right. We put on a rear deck that overlooks the fenced-in dogs’ yard and also built a small house for the dogs. This was actually the very first thing Paul did when we bought this house. We passed papers in November 1986 but didn’t move in til February 1st 1987. During that period we did a lot of interior work, taking out a wall and closets in the two small bedrooms making them into one large living room, but the first thing Paul did was to build that fenced in yard and house for the dogs. At that time we had two Great Pyrenees, Nicodemus and Esmeralda, who basically lived outside most of the time. We named that tree “Pal” in honor of our neighbor who lived to the rear of us. His name was Tony Gambale and he was a landscape gardener. He was a peach of a man. Paul and Tony used to chat over the hedge in the back garden a lot. He was so full of wisdom and old stories. What a guy he was. Well, on the day that we bought this crapapple tree and came home with it to plant it, we learned that Tony had passed away that day, while he was out working. It was such a shock. Tony’s nickname was “Pal” and I don’t really know why, but we decided to dedicate that tree to him, and it has been known as “Pal” ever since. Another nice little area of the garden was what I call the “Angel” or corner garden. Yikes. It’s not the same place! Oh, but it is. Overgrown and in need of tender loving care. Here is one of my favorite pictures, taken one year, many years ago, when my Mum was visiting us from Florida. She had retired and sold our family home in Marblehead just after Paul and I were married. She moved down to Fort Myers, FL, to live in the warmth near her brother Bob and his family. She had arthritis, like I have now, and it really bothered her so much that moving to Florida actually helped her a lot. But I am not a hot weather person and would never go to those lengths just to ease my painful joints. It’s all we can do to keep up with things in this yard. In fact, we don’t really. Things have taken over and, like I said the other day, they grow at their own pace and timetable and we are just innocent observers of Mother Nature. That’s enough for now. Sorry about the length of this blog, but I got carried away. I love your stories of trees and friends. That was a fascinating posting. How lovely to be able to look back at photographs of your property over an expanse of time. I love how you name your various trees. Are there any other named trees? I was also surprised how large your home looks from the back. Maybe you need to change to a few larger windows in the basement, so it’ll be more livable? I’m not a big fan of forsythia but I do MUCH prefer them wild versus trimmed. You have a lovely home, Bex. I can see why you love it so. That was wonderful to read, Bex. The property that my house sits on can in no way be described as a garden … only a yard. My fault. I love your home and your gardens, and I believe that you live in your own bit of paradise, Bex. Thank you for showing it to us. After reading your various entries, I always come away wanting to get busy and do more here. Thanks for that too. The title says it all, remembering trees and friends. I’ll bet you’re glad you took and kept all those photos of how things looked through the years. Wonderful entry, thank you for sharing. What a wonderful pictorial entry. You have beautiful yards. It is amazing to see the change from when you purchased your house and now. I always thought you lived in a small house but when I see it from the back, it looks large. Thank you for sharing your home with us. Nina, well, our house is not that big. It looks larger from the back because the basement is one full story but our basement is not “livable” space – just storage and a work area for Paul. We only have what a small Cape style house has, a tiny dining room, a living room that started out as 2 small bedrooms that we opened up, a kitchen and tiny tiny wee tiny bathroom and a little breakfast room on the first floor and upstairs only a half-bathroom, and two bedrooms, one on either side of the hallway. Not big but just right for us – since we don’t have kids. However, it would amaze anyone to learn that the family we bought this house from raised 5 kids and dogs in this house. That blows my mind. We do get droughts sometimes too, in July & August usually, where all the grass will dry to brown. I used to spend hours with the sprinklers going, watering everything, but not anymore. I let Mother Nature do the gardening these days! Wow! That was super cool to read! By the way, I had no idea your house was so large! Viewed from the front (as I always saw it), it looks like indeed a cottage. Somehow I pictured you and Paul living in the wee house with two cute rooms and a bunch of dogs! The yard looks wonderful. I am jealous that it isn’t subject to the awful heat and drought we’re having here, in Wisconsin. Joan, I hope you will post some pictures of your “re-greening” project, before and after? Would love to see your progress. As always, I love your garden entries! With all of the construction, we’ve gotten rid of so many of our plantings. I want to start to “re-green” the place in the fall! Why thank you, Sarah. But I’m afraid the reason I did this blog was to show that yes, gardens respond to care and love, however, ours currently is sorely missing a lot of that maintenance lately and it shows. It used to be so neat and tidy around here but now it’s more like the wild gardens you said you preferred. I guess I will just prefer wild ,too, seeing as that’s what I’ve got now! This is one of the loveliest blog postings I’ve read in a long time. Thanks for sharing all these pictures and memories! Your home and yard reflect all the loving care and beautiful vision.